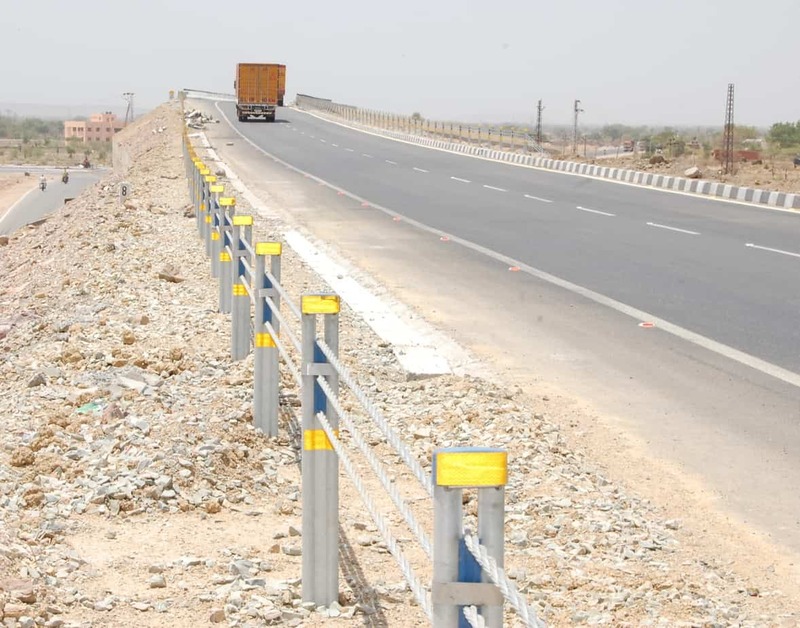 SAFENCE Wire Rope Safety Barriers are made of 19mm High Tensile Steel Wire Rope with a Minimum Tensile Strength of 1375 N/mm2 and a minimum breaking load of 17.9 MT thus giving giving a 3 Wire Rope System a Minimum Breaking Load of approx 60 MT and a 4 Wire Rope System of approx 80 MT making them ideal for Side Applications. Along with the High Containment the system also offers best in class impact severity and flexibility which successfully redirects all kinds of vehicles from small cars to large trucks and buses with minimum impact to the passengers. The Flexibility of the System allows the impact of the errant vehicle to be absorbed over a period of time making it especially useful from vehicles with High Center of Gravity like Trucks and Buses and the tipping over these vehicles is prevented unlike other rigid systems. 3 Rope Wire Rope Systems with variable post centers. 4 Rope Wire Rope Systems with variable post centers. 3 Rope Barrier with 3 meter Post Centers. 3 Rope Barrier with 2.5 meter Post Centers. 4 Rope Barrier with 3 meter Post Centers. 4 Rope Barrier with 2.5 meter Post Centers. 4 Rope Barrier with 1.5 meter Post Centers.